Ram understands that safety is a top concern for all drivers. This is why every Ram 1500 is engineered to the highest safety and security standards. This popular light-duty pickup truck boasts a myriad of features designed to give you maximum peace of mind every time you get behind the wheel. The Ram 1500 experts at Razzari Commercial Center are eager to demonstrate to you all of the innovative safety features of this venerable truck. The optional Parallel and Perpendicular Park Assist system delivers active guidance when parking in those tricky situations. This intuitive system alerts you when to engage the gear position, brake, and accelerator as it controls the steering for you. 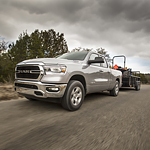 The Ram 1500's patented LaneSense Lane Departure Warning–Plus system helps to prevent potential accidents by alerting the driver to unintentional lane drift. A visual alert is engaged and the vehicle is safely guided back into the proper position.